Central Wyoming College officially dedicated and celebrated the opening of the Intertribal Education and Community Center at a ceremony (today) Friday, March 25 in Riverton. After a decade of planning and fundraising, the 16,713-square foot facility, which opened for classes and community gatherings last October, was officially dedicated during a ceremony on the plaza in front of the building. 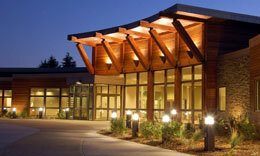 The Intertribal Center has a multipurpose function. In addition to being an educational facility for both CWC and the University of Wyoming, it serves as a venue for conferences, workshops and meetings. It is also a highly visible landmark that celebrates the cultural diversity of the area, said CWC President Jo Anne McFarland. U.S. Sen. Mike Enzi, who obtained federal appropriations that allowed CWC to proceed with construction in 2009, was the special guest. His talk was followed by remarks from UW Provost Myron Allen, Fremont County representatives Del McOmie and Patrick Goggles, as well as tribal and college officials. Eastern Shoshone tribal member Ann Abeyta performed a hoop dance accompanied by a drum group. The ceremony was preceded with an informal feast in the Wind River Room and followed by tours of the building. Funds for the facility came from multiple sources, including state and federal appropriations and private donations. CWC also has received support from the Northern Arapaho, Eastern Shoshone and the Shakopee Mdewankanton Sioux tribes. UW contributed $1.1 million toward the center’s construction to make its Fremont County Outreach Center more visible and accessible.